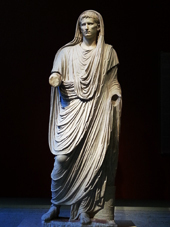 Augustus was, as Emperor, also the head priest of the Roman state. Here he is portrayed as a pious, humble priest – the Pontifex Maximus. The month of August got its name around 8BC, when the Roman Senate wanted to honor their Princeps and Emperor, Augustus. They choose the eighth month of the Roman year, because they wanted to highlight the fact that most of Augustus’s (his birth name was Octavius) military victories and conquests were achieved in this season. Most likely, this is because Summer was the main campaigning season of the year, and most campaigns and conquests came to their conclusion before Autumn set in and the weather made military operations and supply, difficult and hazardous. The Romans renamed their month, and we still use that name over two thousand years later – quite an honor! This year’s Summer Sale ends on September 1st. I wouldn’t know if Augustus would have seen a sale as an honor, but nevertheless: Take the opportunity to buy some unique Big Band charts at a discount, to get your band on its toes right from the very first rehearsal after Summer recess. 20% off on all compositions, and 15% off on all arrangements. Payment for all products can be handled either through PayPal, or through Stripe. After completing the checkout and payment processes, you will immediately be sent an e-mail to the address you specified in the checkout. This mail contains the link(s) for downloading your ordered chart(s). The file format for the chart(s) is PDF and the page format for printing is A4. The link(s) for downloading are valid for 48 hours after the e-mail´s sending and permit 2 downloads each. Should you not find the e-mail in your regular inbox, please check your spam filters or your trash box.